Size of the INDUSTRY The production capacity of wafer biscuits is 60 MT and the cost is Rs.56,78,400 with a motive power of 25 K.W. Geographical distribution Maharashtra, West Bengal, Andhra Pradesh, Karnataka, and Uttar Pradesh. Percentage in world market Indian subcontinent is known to be the second largest manufacturer of biscuits, the first being USA. India Biscuits Industry came into major existence and started gaining a sound status in the bakery industry in the later part of 20th century when the urbanized society called for ready made food products at a tenable cost. Biscuits were assumed as sick-man's diet in earlier days. But today it has become one of the most loved fast food products for every age group. Biscuits are always easy to carry, tasty to eat, cholesterol free and reasonable at cost. States that have the larger intake of biscuits are Maharashtra, West Bengal, Andhra Pradesh, Karnataka, and Uttar Pradesh. Maharashtra and West Bengal are the most industrially developed states; hold the maximum amount of consumption of biscuits. Even, the rural sector consumes around 55 % of the biscuits in the bakery products. Indian Biscuits Industry seems to be the largest among all the food industries and has a turnover of around Rs.3000 crores. Indian subcontinent is known to be the second largest manufacturer of biscuits, the first being USA. The industry is classified under two sectors: organized and unorganized. Bread and biscuits are the major part of the bakery industry and covers around 80 % of the total bakery products in India. Biscuits today stand at a higher value and production level than bread. This belongs to the unorganized sector of the bakery Industry and covers over 70% of the total production. In the year 1990 the total production of bakery products have risen from 5.19 lakh tonnes in 1975 to 18.95 lakh tonnes. Today Biscuits contributes to over 33 % of the total production of bakery and above 79 % of the biscuits are manufactured by the small scale sector of bakery industry comprising both factory and non-factory units in the country. The production capacity of wafer biscuits is 60 MT and the cost is Rs.56, 78,400 with a motive power of 25 K.W. Indian biscuit industry has occupied around 55-60 % of the entire bakery production. 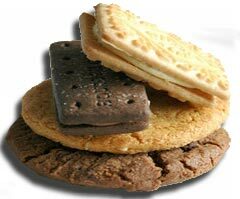 Today the large scale bakery manufacturers like Cadbury, Nestle, and Brooke bond had traded in the biscuit industry but couldn't hit the market because of the local companies that produced only biscuits. Government has established The Federation of Biscuit Manufacturers of India (FBMI) which has confirmed a bright future of India Biscuits Industry in the year 1953. According to FBMI, a steady growth of 15 % per annum in the next 10 years will be achieved by the biscuit industry of India. Besides, the export of biscuits will also surpass the target and hit the global market successfully. Today the total production of biscuits in India is estimated to be around 30 lakh MT, the organized sector accounts for 65% and the unorganized sector accounts for 35% of the total industry volume and the organized sector is valued at above Rs 8000 crores. While the the biscuit industry is estimated to grow over 15-17% in the next few years. The biscuits per capita consumption in India is 2.0 kg. India is ranked 3rd after US and China amongst the global biscuits producers. The export of biscuits is approximately 17% of the annual production, the export of sweet biscuits for year 2007-08 was Rs 145.93 Cr and for year 2008-09(April-Dec) was Rs 280 Cr, the major exporting regions were Haiti, Angola, USA, Ghana, UAE. The imports are not significant amount as compared to the total consumption. The penetration of biscuits in India among the urban and rural market is 85% and 55% respectively. The annual turnover for the organized sector of the biscuit manufacturers at 2001-02 is Rs. 4,350 crores. The annual Growth showed a decline of 3.5% in 2000-01, mainly due to 100% hike in Central Excise Duty (from 9% to 16%) by the government. Production in the year 2001-02 increased very marginally by 2.75% where in 2002-03 the growth is around 3%. Government took initiatitive for the development as The Union Budget for 2003-04 granted 50% reduction in the rate of Excise Duty on Biscuit i.e. from 16% to 8%. The Federation's estimate indicates a growth of approximately 8% to 9% per year. Biscuit is always hygienically packaged nutritious snack food available at very competitive prices, volumes and different tastes. According to the NCAER analysis, biscuits are predominantly consumed by people from the lower strata of society, particularly children in both rural and urban areas with an average monthly income of Rs. 750and above. India Biscuits Industry is the largest among all the food industries and has a turnover of around Rs.4350 crores. The production capacity of wafer biscuits is 60 MT and the cost is Rs.56, 78,400 with a motive power of 25 K.W. Indian biscuit industry has occupied around 55-60 % of the entire bakery production. 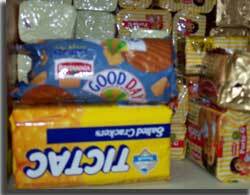 The Indian Biscuit industry for the organized sector produces around 60% of the total production, the balance 40% being contributed by the unorganized bakeries. The industry consists of two large scale manufacturers, around 50 medium scale brands and small scale units ranging up to 2500 units in the country, as at 2000-01. The unorganized sector is estimated to approximately have 30,000 small & tiny bakeries across the country. Biscuit industry contribute Rs 8,000 crore to the FMCG industry today, provides vast opportunity for growth, as the per capita consumption of biscuits is less than 2.1 kg in our country. India is classified under two sectors: organized and unorganized. Branded /Organized to Unbranded/Un organized market share of biscuit has been 70% for Organized sector and 30% for Unorganized sector. Apart from Big 3(Britannia, Parle, ITC) there are around 150 medium to small biscuit factory in India. The Biscuit industry employs almost 3.5 lakh people directly and 30 lakh people indirectly. Brittania brand is now available in nearly 1.8 million outlets. Britannia claims that it has a superior distribution clout with its presence which is nearly 3.3 million outlets. Parle, the seasoned player itself, says it is available in 1.5 million outlets. Sunfeast's next step was to step up its branding and promotion. Indian biscuit market is 1.1 million tonnes per annum at Rs 50 billion. About 90% of Indians buy and eat biscuits. According to estimates the bakery industry in India is worth Rs 69 billion. Out of which bread and biscuits hold about 82% of the share. The bread market has a business volume of 1.5 million tonnes. The major factors for growth in this segment are: Brand loyalty, volumes and strong distribution networks. Growth in the over 40-year-old Indian biscuit industry has remained slow. The analyst's calculations will show that per capita consumption is less than Rs 3 per month on biscuits or less than Rs 15 per household per month. Back in 2003, nobody thought Sunfeast would have consumers eating out of its hands. According to the AC Nielsen retail sales audit in March 2006, both Britannia and Parle have lost volumes. Britannia's shares have dropped from 35.8 % in 2004-05 to 30.5 % in May 2006 (volumes). Parle's shares have also dropped from 42.2 to 38.4 % in the same period. Even Priya Gold has seen a minor dip from 6.4 % to 5 %. ITC's Sunfeast has been a big gainer with its share increasing from 2.7 to 6.7 %.